Laos may very well be one of the last countries in the region that remains untainted by mass tourism, and yet, this refreshingly simple country does not disappoint when it comes to unspoiled nature and wildlife, uniquely rustic and flavorful cuisine, fairy tale landscapes, and the warmth and friendliness of its people. Discover the stunning northern part of this magical country and explore an area previously known as Xaysomboun Special Zone, a stunning area that was only recently strictly off-limits due to hostilities with Hmong rebels, and a now well-known CIA secret airbase where war against communism was fought. Immerse yourself in Laos’ deep-rooted traditions and culture, explore Laos' less-traveled side via its scenic and perfectly paved backroads, and get lost in time on this moderately challenging road bike tour where we bring you on an adventure beyond the wall of its charming capital city that is Vientiane! We meet in the late afternoon for a bike fitting and trip briefing. Welcome dinner at a traditional Lao restaurant. The ride is on a nice, flat road along the contours of the Mekong River, which we follow towards the San River. We should reach our destination before sunset, which we can enjoy on the banks of the river. 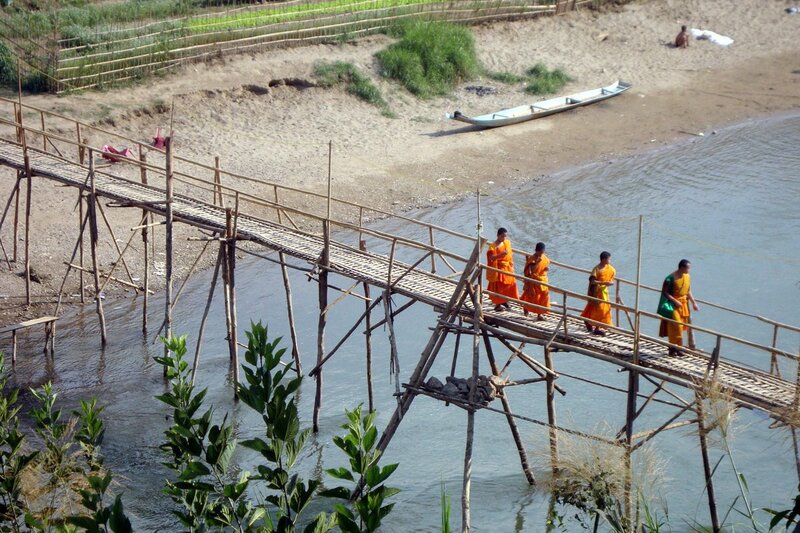 Leave the Mekong Valley and ride north along the San River to Laos’ highest mountain, Phou Bia (2,819 m). The road takes us through Xaysomboun Special Zone, a restricted area that was, until recently, strictly off-limits, Visit Muang Khoun, the ancient capital of the powerful Xieng Khouang Kingdom, and overnight in Muang Khoun. Explore what was once one of the most heavily bombed areas of the country and visit ancient temples and local villages. Discover the mysterious, prehistoric Plain of Jars; an area littered with 2,000-year-old stone jars. Visit the MAG Centre, a humanitarian organisation clearing UXOs (unexploded ordnances). This is another tough day, but extremely scenic, with a gentle roll out of Phonsavanh. Our overnight stop is just outside Phou Khoun with breath-taking karst mountains views. Heading south, we start riding downhill back into the Mekong Valley, fol-lowed by a few mild climbs before reaching the Nam Xong River where we ride through limestone outcrops. On arrival, there's time for a swim, a stroll along the river, or a paddle-around on a kayak. The up-and-down ride today takes us to the Nam Ngeum reservoir. We continue to the top of the lake before rolling down to our riverside hotel (with pool!). We ride back to Vientiane on a flat road across the Nam Ngeum River. The journey ends at Phatuxay, Lao’s L'Arc de Triomphe. After lunch, you can fly out in the after-noon or evening, or spend another night exploring the capital. Day 2 - Vientiane- Paksan Ride 83km. +229m. The total distance is 666 km in 7 riding days. This tour is primarily on tarmac road with some dirt road sections thrown into the mix. 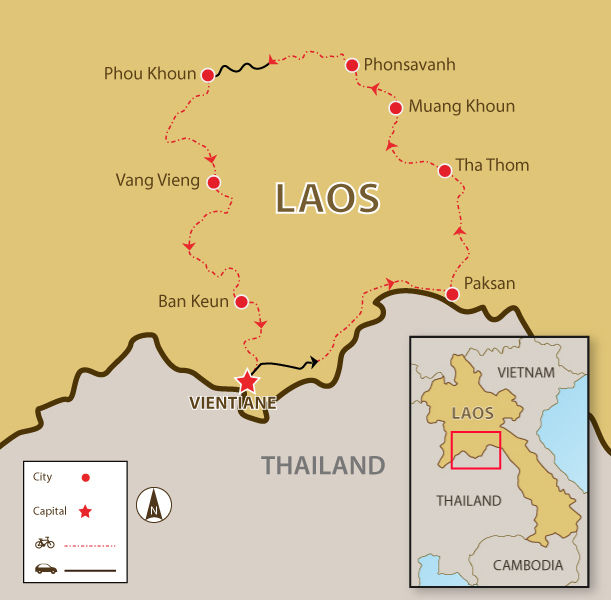 We start in Vientiane, and there are a few climbs throughout as we go into the foothills of Laos' highest mountain, visit ancient temples and colonial heritage sites in the old capital of Xieng Khouang, cycle up towards Phou Khoun, famous for its very steep southern ascent, and enjoy the rolling hills of the Nam Ngum River. The trip is fully supported, and your guide’s expert knowledge of the area and terrain means that you always know what is coming up in terms of distance and difficulty. This makes a tremendous difference, as does the constant supply of cold drinks and fresh fruit. Suitability: Fitness, of course, will be a huge asset, but as the tour is fully supported, the bus is always close at hand. There are some challenging hills on this tour, so having some climbing experience will be helpful. Biking Conditions: You can expect a few tough rides due to the daily distances. The roads will be primarily tarmac, but there will be one long dirt section of 26 km. We meet at 5 pm, when the guide will brief everyone thoroughly and make sure the bikes fit. We then head out to dinner of a traditional Lao meal or try one of the city’s many restaurants. We transfer out of the city just over an hour to the town of Naxay, where we start our riding. Our first day on the bikes will be a nice and flat warm-up for the hills to come! We cycle on a good road, following the contours of the Mekong River downstream towards Paksan (Pak means mouth, and Paksan translates as “the mouth of the San River”). We should reach our destination well before sunset, which we can enjoy on the banks of the Mekong River. We leave the Mekong Valley and head north, following the San River upstream into the foothills of Laos’ highest mountain, Phou Bia (2,819 m). The riding is tough today as part of this road is powdered dirt, and there are some climbs to conquer. After a warm-up of 26 km, our first steep climb is a short 1 km, an appetiser of things to come. We then undulate for the next 30+ km before we meet a beast – a 3-km hill with a 250-m ascent. Once conquered, a downhill awaits. We overnight at a very simple guesthouse, but there is no other choice in this remote region. The facilities are basic, but you will have an en suite bathroom. We ride through truly hidden Laos. The road we take runs through an area previously called Xaysomboun Special Zone, a restricted area that was, until recently, strictly off-limits due to hostilities with Hmong rebels. The road, once not more than a dirt trail, has been improved and is quickly becoming the preferred route for traveling between Vientiane and Xieng Khouang Province. At 40 km into the ride, we embark on a more serious 20-km climb onto the plateau (average slope 4%; elevation gain 900 m). The option to transfer to the top is always available. Once on the plateau, our ride flattens out and brings us to Muang Khoun, the ancient capital of the powerful Xieng Khouang Kingdom. Unfortunately, this town was bombed to the ground during the first and second Indochina Wars. We start the day by visiting a few ancient temples and colonial heritage sites in the old capital of Xieng Khouang. From here, we cycle the final 35 km of the day on a flat road, through rice paddies, to the provincial capital Phonsavan, located in the centre of the Plain of Jars. The Plain of Jars is a huge archaeological complex littered with mysterious 2,000 years old stone jars. Their true origin remains a mystery, and they seem carved into boulders. Your trip enables you to visit the 3 sites and also discover some local villages where you can observe local village life. You can also visit Ban Xiengdi, where there is a small monastery with Buddha images. On the way back, you will pass areas that were important battlefields during the American secret war. You can still see bomb craters from that time today. After checking into your hotel, feel free visit the MAG Centre. MAG is a humanitarian organisation clearing UXOs (unexploded ordnances), the remnants of conflict for the benefit of local communities worldwide. Lao PDR is the most heavily bombed nation in the world (per capita). As there are many dinner options in town, we'll let you explore them on your own. Attention: The Plain of Jars has been heavily bombed during the war, and you must respect all the signs and stay along the defined trails due to bombs, UXO, and landmines. Well rested, we start another tough, but extremely scenic day with a gentle roll out of Phonsavanh. After around 50 km, the first of the more serious hills meets us, after which we are rewarded with a nice downhill. We stop for a late lunch and load up the bikes as the next section involves climbing up to 1,500 m. Our overnight stop just outside the town of Phou Khoun, which has outstanding views of karst mountains and is a perfect place to be at sunset. Phou Khoun is famous for its very steep southern ascent. Luckily, we will be heading south, and so start the day with a magnificent downhill back into the Mekong Valley. Approximately half way, near the district town of Kasi, there are a couple of mild climbs before we roll along the Nam Xong River through the limestone outcrops of Vang Vieng. An early arrival allows for a swim in or a stroll along the river, or even a try on a kayak. With many options for dinner in town, you have free reign tonight. The up-and-down ride today takes us along the western side of the vast Nam Ngeum reservoir, the first major hydropower project in Laos developed in the late 1960s. After 22 km, we reach the top of the lake, and then another 60 km of rolling hills takes us to our pleasantly located hotel (with pool!) on the Nam Ngeum River. This is a long ride, so lifts up over the hills are always available. The home stretch is a breeze with 64 km of flat road back to Vientiane. On the way, we cross the Nam Ngeum River via a steel bridge. Our tour in Laos culminates at Phatuxay, Vientiane’s own Arc de Triumph. We have lunch at a hotel with day rooms for showering. You can fly out in the afternoon or evening or stay another night to explore the capital of Laos. Because some people can't imagine going on a trip without their own beloved bicycle, we do not provide them as part of this tour. However, you can hire bikes locally for the price listed in the tour pricing section. The bikes are mountain bikes with Shimano components and front shocks. If you have your own saddle that you are comfortable with, you are welcome to bring it, and we'll fit it. We can provide strap-style toe cages if requested, but you might like to consider bringing SPD clip pedals if you use them, and please bring your shoes and cleats. If you bring your own bike, please make sure it is a mountain bike that it is in good mechanical order.